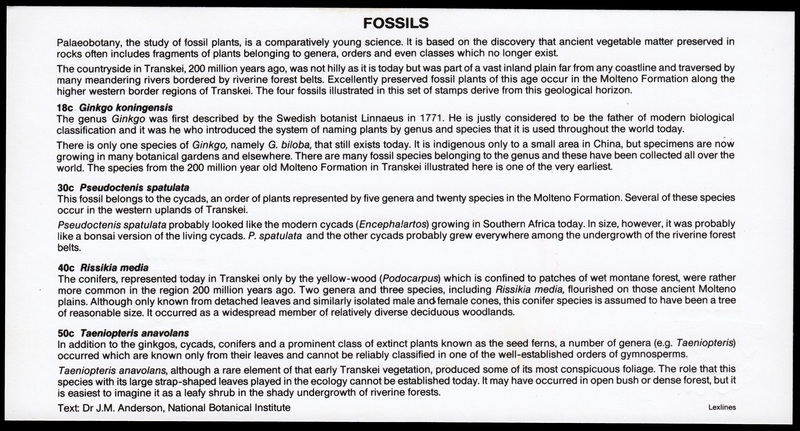 Transkei 1990 "Fossils: 1st set of the series"
Palaeobotany, the study of fossil plants, is a comparatively young science. 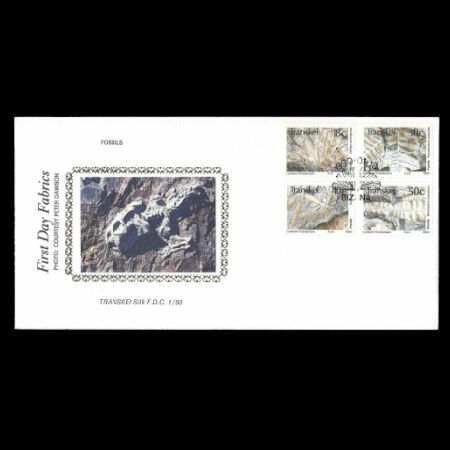 lt is based on the discovery that ancient vegetable matter preserved in rocks often includes fragments of plants belonging to genera, orders and even classes which no longer exist. 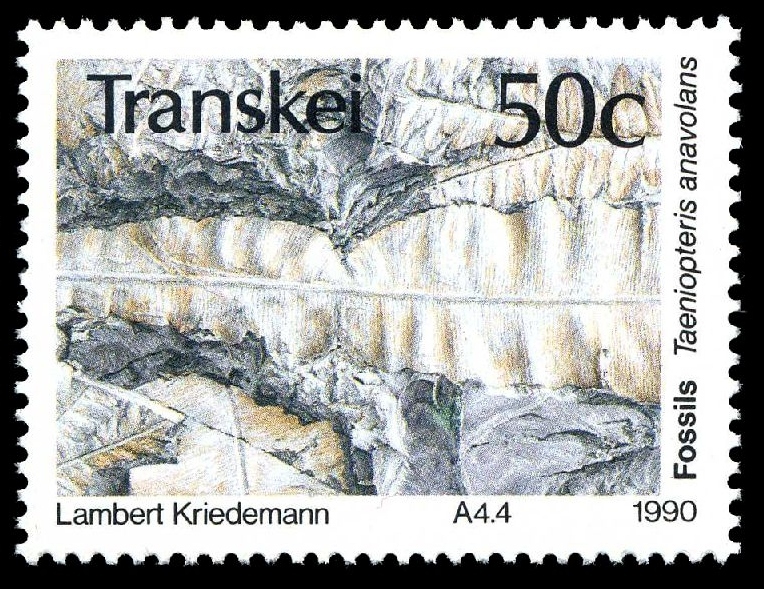 The countryside in Transkei, 200 million years ago, was not hilly as it is today but was part of a vast inland plain far from any coastline and traversed by many meandering rivers bordered by riverine forest belts. 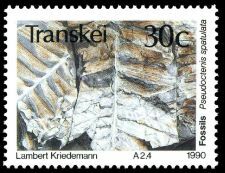 Excellently preserved fossil plants of this age occur in the Molteno Formation along the higher western border regions of Transkei. 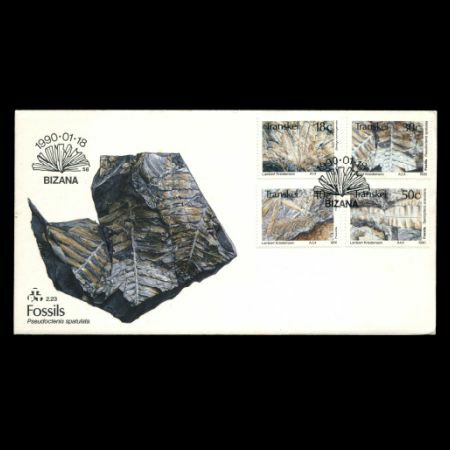 The four fossils illustrated in this set of stamps derive from this geological horizon. 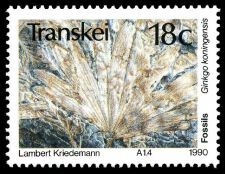 This fossil belongs to the cycads, an order of plants represented by five genera and twenty species in the Molteno Formation. Several of these species occur in the western uplands of Transkei. Pseudoctenis spatulata probably looked like the modern cycads (Encephalarfos) growing in Southern Africa today. In size, however, it was probably like a bonsai version of the living cycads. P. spatulaia and the other cycads probably grew everywhere among the undergrowth of the riverine forest belts. 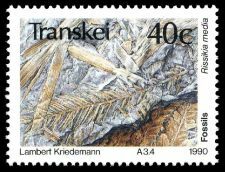 The conifers, represented today in Transkei only by the yellow-wood (Podocarpus) which is confined to patches of wet montane forest, were rather more common in the region 200 million years ago. 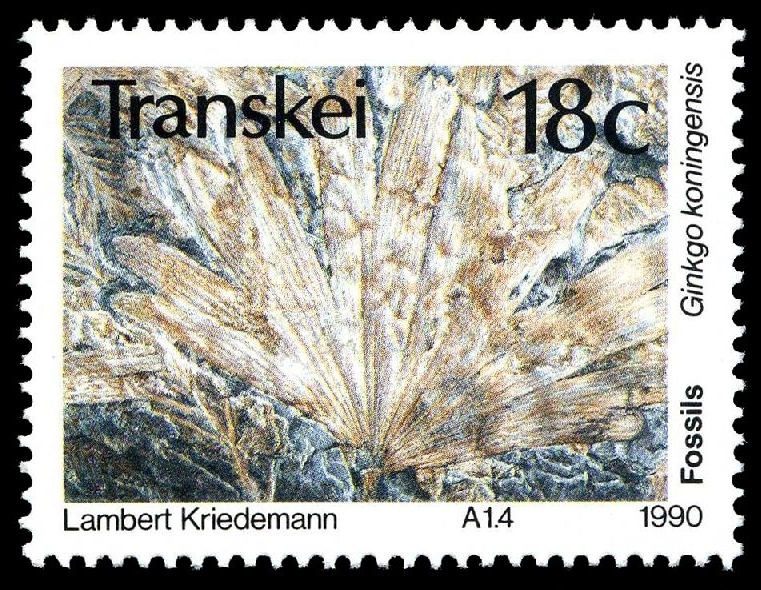 Two genera and three species, including Rissikia media, flourished on those ancient Molteno plains. 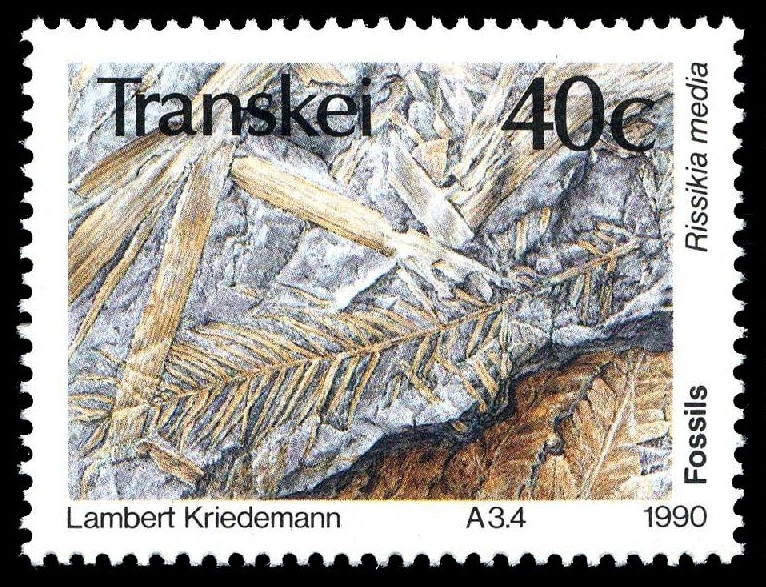 Although only known from detached leaves and similarly isolated male andfemale cones, this conifer species is assumed to have been a tree of reasonable size. It occurred as a widespread member of relatively diverse deciduous woodlands. 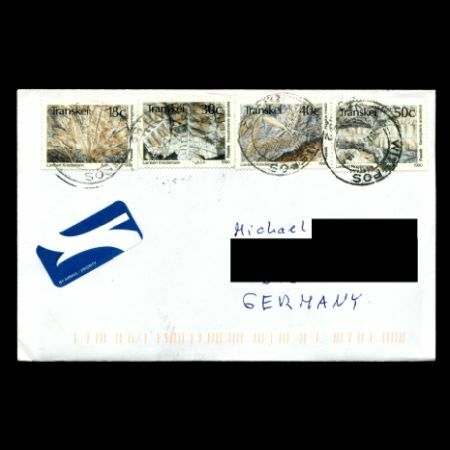 In addition to the ginkgos, cycads, conifers and a prominent class of extinct plants known as the seed ferns, a number of genera (e.g. Taeniopteris) occurred which are known only from their leaves and cannot be reliably classified in one of the well-established orders of gymnosperms. 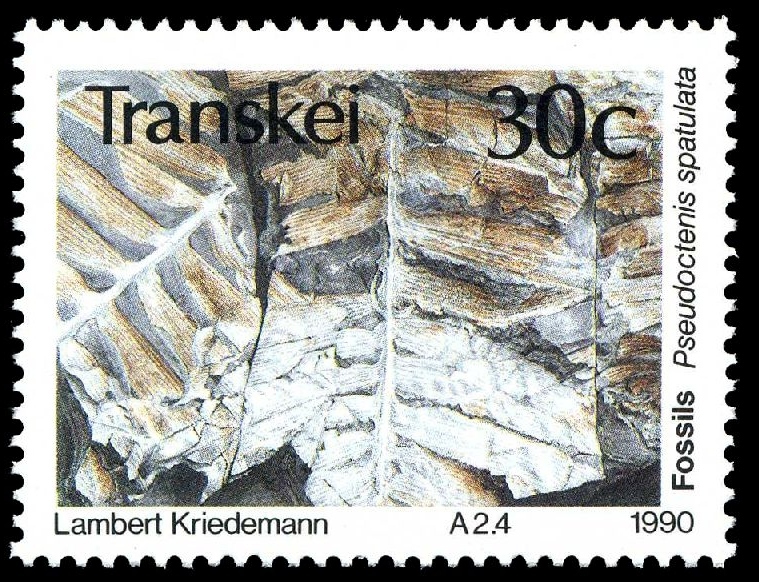 Taeniopteris anavolans, although a rare element of that early Transkei vegetation, produced some of its most conspicuous foliage. The role that this species with its large strap-shaped leaves played in the ecology cannot be established today. lt may have occurred in open bush or dense forest, but it is easiest to imagine it as a leafy shrub in the shady undergrowth of riverine forests. 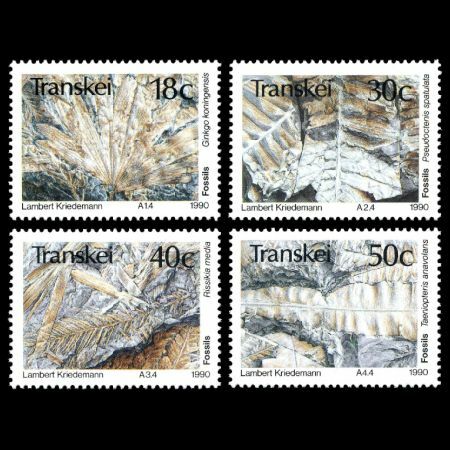 Transkei 1992 "Fossils" 2nd set of the series"